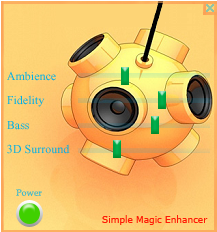 Simple Magic Audio Enhancer is a sound enhancement/improvement/dsp effects software for digital music. This DSP plugin for Winamp enhances your music listening experience by improving the sound quality of MP3, Windows Media, Internet radio and other music files. With Simple Magic Audio Enhancer you can transform the sound of your PC into that of an expensive stereo system placed in a perfectly designed listening environment. ...... Renew stereo depth, boost your audio levels and produce a deep, rich bass sound. Qweas is providing links to Simple Magic Audio Enhancer for Winamp as a courtesy, and makes no representations regarding Simple Magic Audio Enhancer or any other applications or any information related thereto. Any questions, complaints or claims regarding this application Simple Magic Audio Enhancer for Winamp must be directed to the appropriate software vendor. You may click the publisher link of Simple Magic Audio Enhancer on the top of this page to get more details about the vendor.